Dolce & Gabbana floral lace bootie. Dolce & Gabbana mesh-knit ankle bootie with flower embroidery. 3.5" suede-covered heel. Pointed toe. Pull-on style. Leather lining. Smooth outsole. Dolce & Gabbana mesh-knit ankle bootie with flower embroidery. 3.5" suede-covered heel. Pointed toe. Pull-on style. Leather lining. Smooth outsole. Made in Italy. Dolce & Gabbana booties in leopard-printed sequin. 4.3" covered stiletto heel. Pointed toe. Pull-on style. Leather lining. Smooth outsole. Made in Italy. 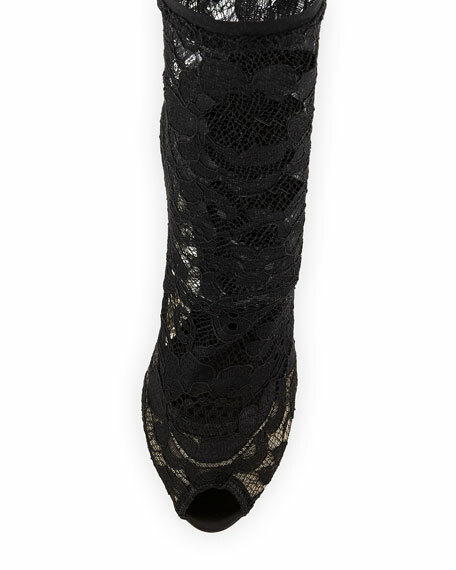 Dolce & Gabbana floral-lace over-the-knee boot. 4.3" covered stiletto heel. Round toe. Pull-on style. Padded footbed. Made in Italy.